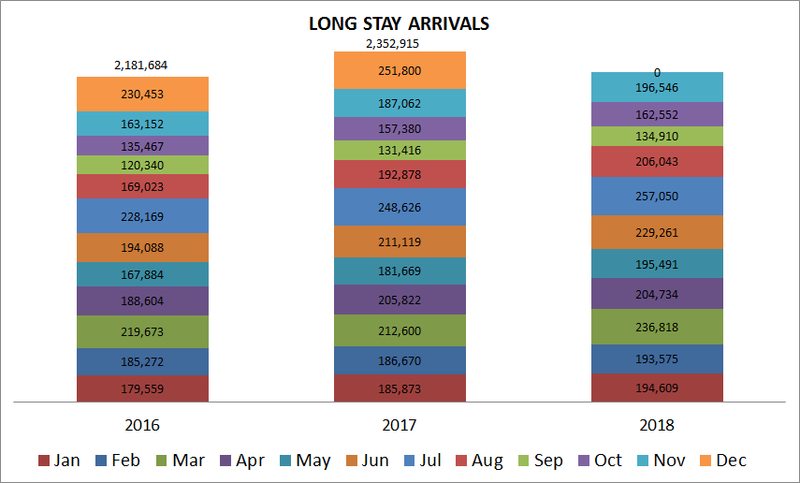 The Image shows passenger arrivals via aircraft monthly from January 2016 to November 2018. Click on the Image to enlarge. Long Stay Arrivals represents the most critical part of Jamaica’s tourism product as this is where money is spent via tourist stays at hotels and spend at restaurant and with local shops and the community surrounding our tourism hubs: Montego Bay, Ocho Rios, Negril, Port Antonio and the South Coast. Keep checking the Industries Dashboard monthly to track information related to passenger arrivals via aircraft.